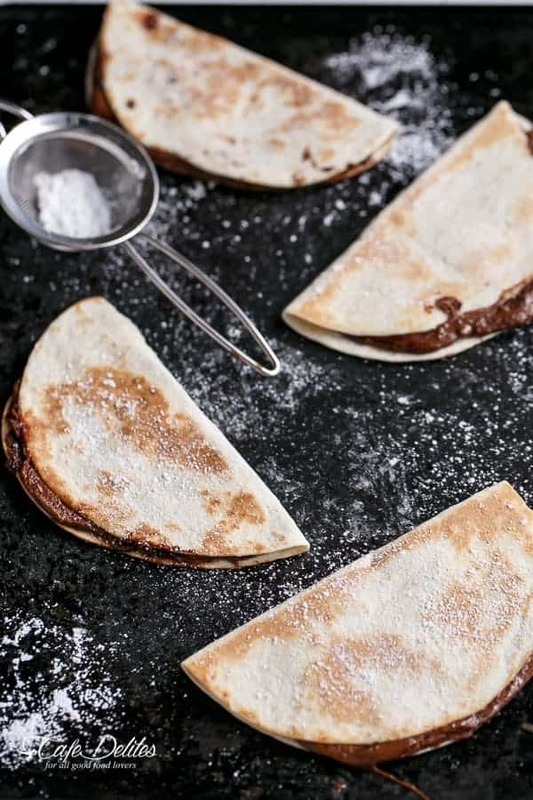 Warmed and golden flour tortillas filled with warm and melted Nutella in under 5 minutes. Does it get any better? No. These are so simple…I didn’t want them on my blog. BUT! My son insisted they go up. Because they’re his favourite snack. Okay. So they’re my favourite snack passed down to him. That counts, right? It’s kind of a crime to post something with only two ingredients and possibly the quickest cooking time ever. All you have to do? 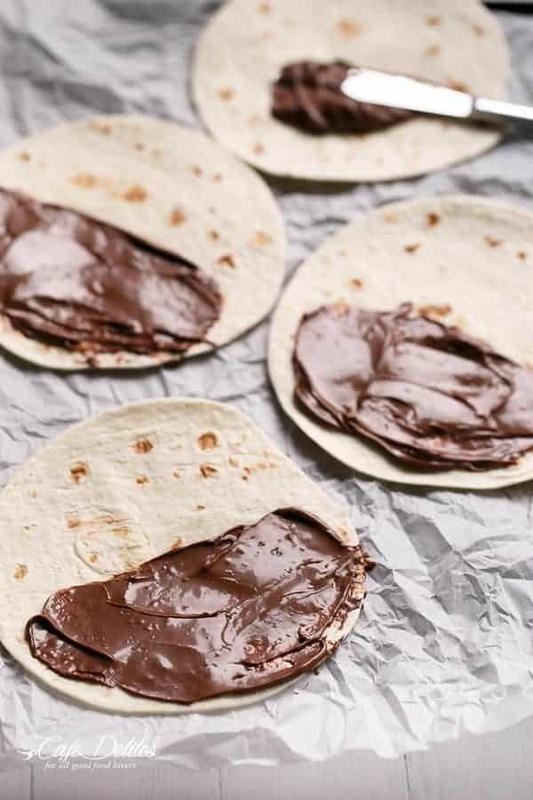 Is spread the Nutella on some flour tortillas. 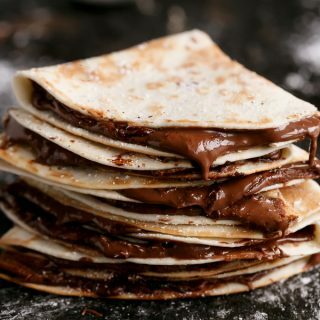 Then fry them up in a nonstick pan until they’re warm and golden on the outside….and gooey with melted Nutella on the inside. Dust with a tiny amount of icing sugar for extra I.don’t.know.what.because.they.don’t.need.it.but.he.insisted. You can add sliced bananas, strawberries, blueberries, or even some sweet cheese slices. But for today only…he just wanted Nutella. And serve with whatever your heart desires. For today…he just wanted them plain. Like this. And he just wanted to hold them up for you guys…like this…with trembling and excited little 6 year old hands after patiently waiting on the side lines just watching me work. 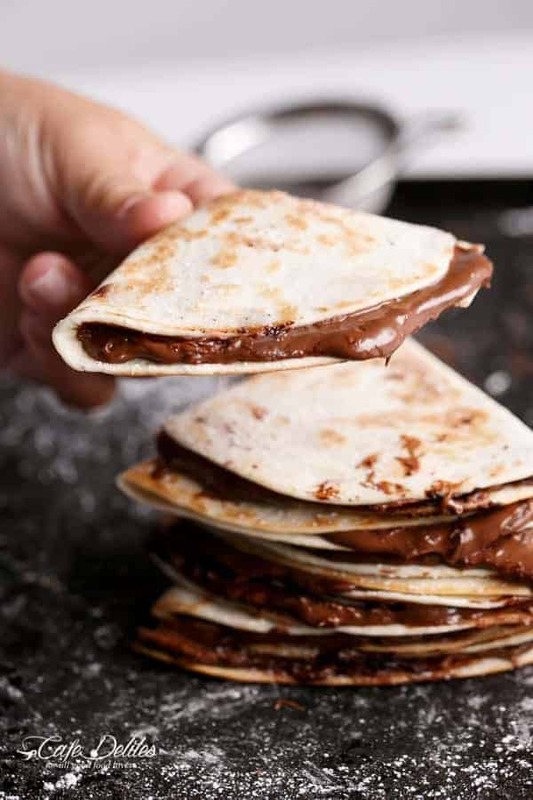 Or, watching the Nutella ooze out of the tortillas, busting to eat one. Weight Watchers: 5pp per quesadilla! 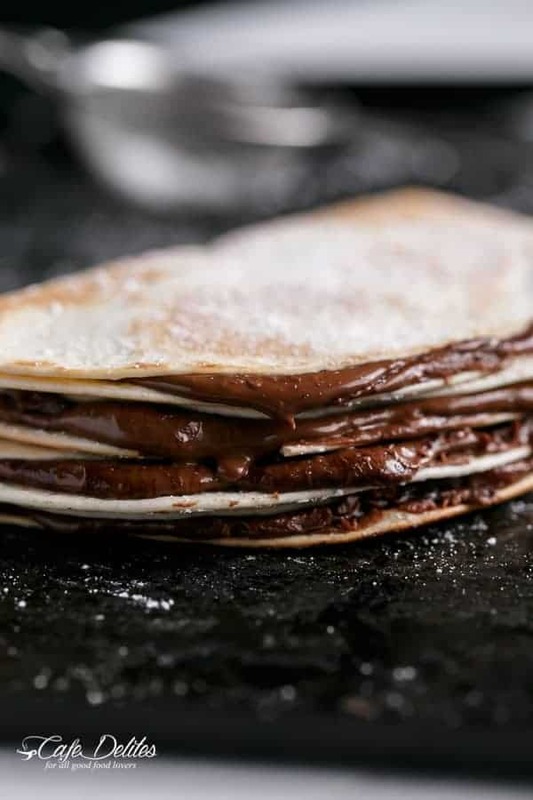 1-2 tablespoons Nutella per tortilla OR hazelnut cacao spread for a healthier option. Preheat a nonstick pan with cooking oil spray. 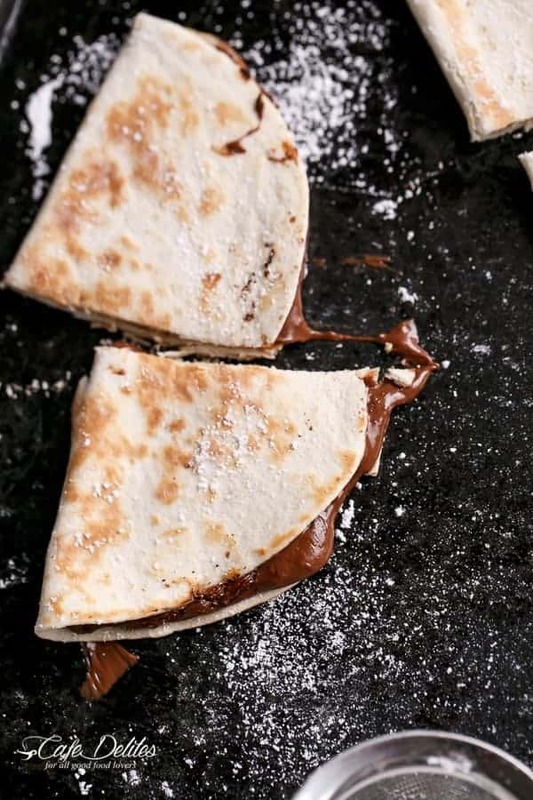 Spread the Nutella covering one half of each tortilla. 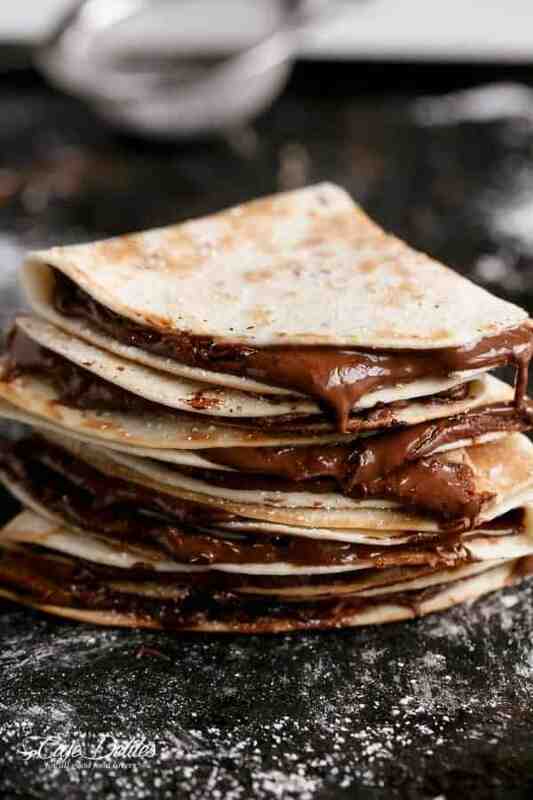 Fold each tortilla over and fry on both sides until golden browned and Nutella has melted through. To serve, cut in half (optional), and serve with fresh fruit, berries, ice cream, whipped cream, or plain! Aaah this is amazing! So simple yet so good… Thank you for sharing it! You’re very welcome Laura! Enjoy! I’m definitely going to try this! Looks fantastic. I recently cooked chicken stuffed quesadillas myself. Seeing your recipe gave me the great idea to have a sweet type of “quesadilla” next time on the side for dessert! This Nutella concept would be perfect. I will definitely be trying this out soon and adding some bananas and strawberries as well! Girl these look so sinful and just Yumm!! I want them now! Ok I thought I had a nutella obsession…but woman you have me beat…I make something similar except I add bananas!!! I too have never thought of blogging it cause of the simplicity…but you convinced me! Ummm. I don;t know what your talking about 😉 Does: My son made me do it? Work at all? Haha. Post it girl!